Well that was a bit of a challenge! I can’t say I have ever made a lace skirt before, but (now I know what I know) I will definitely try again. This one is not very well made. It is uneven and bodged together. I bought 3m of the lace, so I can have another go). I wasn’t at all sure how to make it, so asked for your advice. Thank you so much for taking the trouble to give me some. This Sophie Hulme cotton lace remnant is adorable. (For those of you who have fallen in love with it I am sorry to report it is all gone). But it is created with the dinosaurs marching across the fabric (away from and towards the finished edge). Unless I had the Triceratops head or tail upwards I couldn’t rely on a finished edge for the hem (with the lace sleeved dress I was able to use the edge for the cuff). This was my first mistake. I made a mistake with my pattern too. 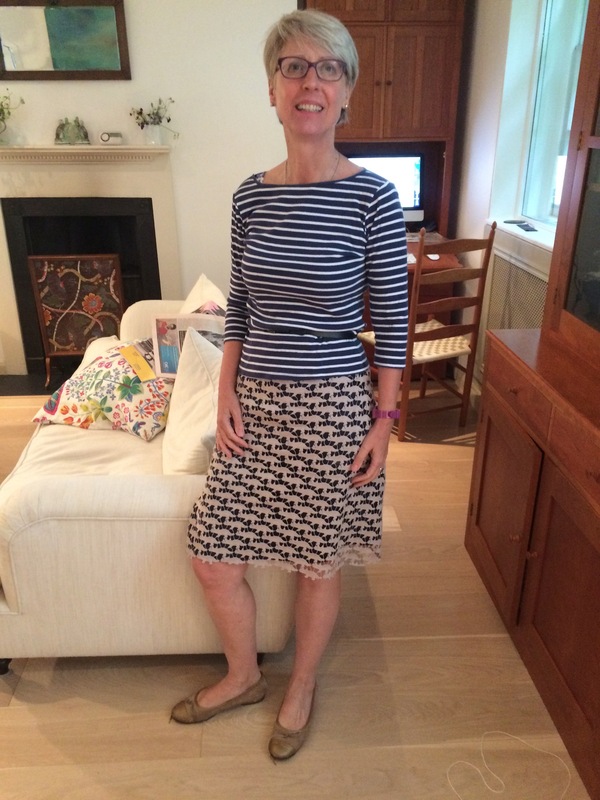 My plan was to use a favourite RTW lace skirt as my pattern. This was a good plan, except I had not realised it was a skirt made with a single piece of fabric. While the skirt is nice and flat across the front of the body, and the lace carries around in a pleasing way, the shaping of the skirt means the CF seam is not on the straight grain. Therefore the dinosaurs sort of collide in a slightly chevron shape, creating no end of problems in joining the skirt together. Consequently the finished skirt does have an ugly kick-flare at the CB (not intended). I considered using an invisible zip but didn’t have the right colour, so I hand picked a beige zip. This worked fine, but I would certainly recommend an invisible zip if the fabric was a bit less “holey” and the CB was on grain. I tried sewing the lining and lace together. This worked until it came to the hem. I unpicked it. Then I stitched the lining separately and narrow hemmed it. I joined the lace with a technique suggested in GBSB Fashion with Fabric by Claire-Louise Hardie for “hairline seams”. 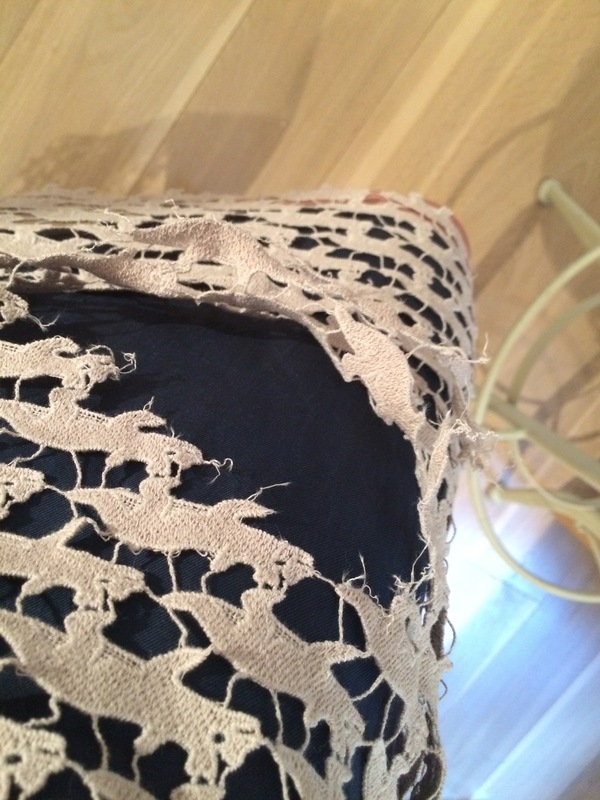 This involves stitching the seam, trimming the fabric away and finishing with a narrow zig-zag. This may have worked on lacey cloth, but it was impossible with my guipure lace. Finally I resorted to cutting the lace with a narrow seam, overlaying it and hand stitching (as did with the darts). It wasn’t perfect but it was the best technique I found. Next time round I will try mounting the guipure lace on a backing fabric – can’t see any other way around it. I had intended to create waist facings, but my RTW skirt had a piece of gros grain ribbon, so I copied this technique. The lace and the lining were stitched to the ribbon, which was then pressed into place and secured at the darts. This approach – a variation of Mrs Mole’s advice – worked well. In addition I didn’t know how to finish the hem. The original had a sort of bound hem, but then the pattern was much simpler than my dinosaur. In the end I just left it unfinished as Demented Fairy suggested. I am sure this is not ideal, but I tried quite a few techniques and all of them were just too bulky and spoiled the pattern. I wore the skirt to work today and something sad, and very serious, happened. I had already had a little lace accident with a table clip. But then I walked past a drawer and the knob caught the skirt. And this happened. As a result I have decided that this beautiful, fun, modern lace is not really suitable for a whole garment. I won’t be mending it. I may use the skirt for scraps. Sad. But unless I protect the dinosaur lace by stitching it to a backing fabric, or covering it with a sheer layer I don’t think fragile lace works with my lifestyle. What a shame. However, not a meaningless project as you have learned so much along the way. On no, sorry the Dinolace is extinct. Would it be cute on collar, cuffs, pocket etc on a shirt? I’m learning lots from you and the commenters. 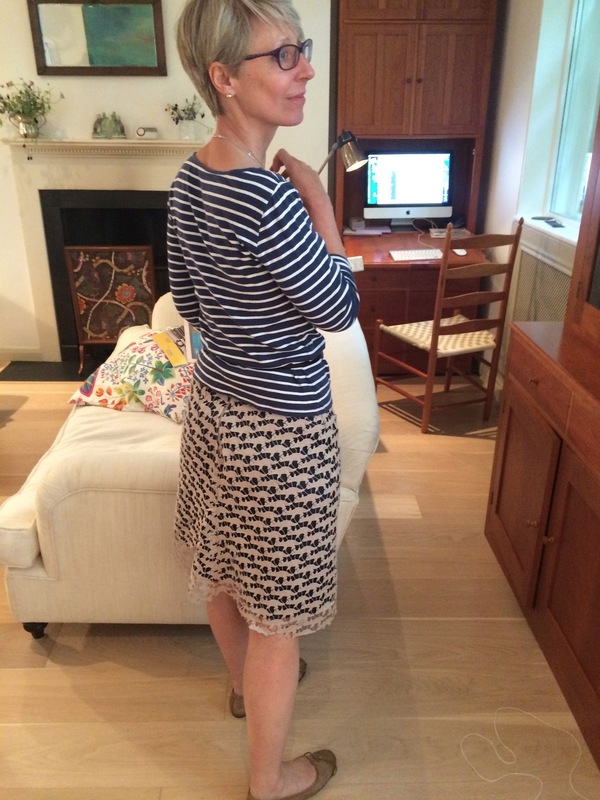 …and I love the little dinosaur-leg hem, very cute! Love the lace hem but what a surprise ending! Sorry to hear about the skirt, but intrepid you will no doubt find a good use for the lace. Interesting process, too. I have a feeling that a lace skirt made my me would meet a similar end as I am very very clumsy. PS K I really love your haircut. Chalk this one up as an experiment. It wasn’t the easiest lace to work with but you had a chance to practice techniques. Every lace is a little different. One tip about hemming and seams: hem the underlay first and then sew the side seams. I’m sure your next try will have better results. I’m with Mary and besides all the new techniques you used and learned…another lesson we have all learned from you is not all garments are workplace friendly! The dinos can rise from the ashes to become any sort of cute accent or throw pillow or even become dyed dinos for a new smaller project. Thank you for sharing the good, the bad and the ugly, Kate. That’s a pity. A lace skirt seemed like just the right idea for this fabric. Enough over for a long lace skirt for non work activities? It looks as though the lace would slice up into pieces pretty well, so a couple of other thoughts – a deep collar on a dark top, lace used like colour blocking on a dress, mounted on a firmer fabric. A long lace skirt is such a nice idea Jay, and as you say less hazards at an evening do. I think, had I actually mounted it on some backing material rather than just lining it, I would have got away with it. What a disappointment and it was going so well too. I’ll wait to see if your dinosaurs are extinct, or if they live to fight another day. Oh how sad! It was so very cute, too. I also like your haircut. Condolences, if there is any thing I can’t stand its this type of learning opportunity……and now that I think of it exactly what would happen if I wore a lace skirt. I can envision my terrible fury, too…..flashing back to ripping the pocket of a lovely silk jacket on a bathroom stall latch thing. Such a shame. Still, you have kept very calm about it – I would rant for days. Ultimately, as is the beauty of sewing, it all adds to our experience. Frustrating at the time though. So sad that it ripped! Oh well. Save those scraps for something bridal. Wow, I don’t read many blog posts that give such heart breaking surprise endings! So sorry about your beautiful skirt. Did you cry? I would have cried! Actually I didn’t because I wasn’t satisfied with the skirt. The accident gives me the excuse to try again. I am more and more convinced that all I really like about sewing is the process of learning – I have many more clothes than I will ever need. What a sad outcome! Looking forward to your next one, though.